BANGALORE: Efforts to start the Gulbarga University began in 1967-68, when Mahadevappa Rampure, the founder-chairman of the Hyderabad Karnatak Education Society and a member of the Karnatak University Syndicate moved a proposal for starting a post-graduate centre under the university. Prominent personalities of the region, including Chandrashekhar Patil, the then chief minister Veerendra Patil, Prof V P Deulgaonkar and Dr Sharanabasappa Appa, strongly supported the proposal for a new university. The region, then, had 22 colleges affiliated to it, with over 8,000 students. The post-graduate (PG) centre was set up at the Kusnoor Hill area in August 1970, and three departments were started. During the inauguration, the then Vice-Chancellor of the Karnatak University, Dr A S Adke, said, “If we develop the PG centre properly, we shall be able to have a new university at an early date. I am very keen that we should have the new university as early as possible.” Subsequently, another PG centre was started at Sandur. The syndicate of the Karnatak University, chaired by its Vice- Chancellor S S Wodeyar resolved in 1978 to establish an university in Gulbarga, covering the present five districts of Bellary, Bidar, Gulbarga, Koppal and Raichur. 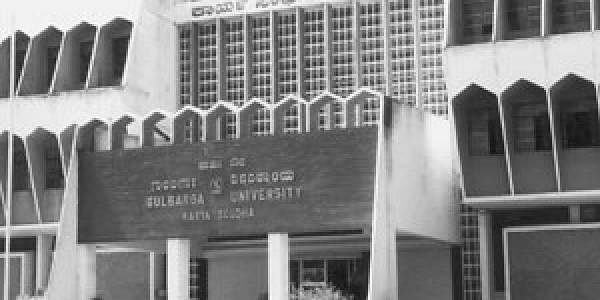 It was in 1980 that the Gulbarga University came into being. Gulbarga, though considered economically backward, has a glorious past. The very first known work in Kannada literature ‘Kaviraja Marga’ was authored here in the 8th century by Sreevijaya during the reign of emperor Nrupathunga. It was around 1857 that the Bombay-Madras railway track was laid. The railway line passed through Gulbarga, thus opening up new horizons for people in the region. New opportunities became available as the youth in the district looked towards Pune and Mumbai for higher education. Vittalrao Deulgaonkar, a leading lawyer of the town, along with like-minded people, then decided that it was time for Gulbarga to have an institution of higher learning of its own. Thus was born Nutan Education Society and Nutan Vidyalaya in June 1907. Many students and teachers of Nutan Vidyalaya took part in the freedom struggle. The institution is among the oldest to be affiliated to the Gulbarga University. The Gulbarga University was the first in the state to start an inter-disciplinary course in bio-technology. The bio-technology department recently isolated microbial strains for enriching the soil as a biofertiliser and biocontrol. Sugarcane varieties released by the university have been showing good results on the field. It has established liaisons with the Central Food Technological Research University, besides some private industries. The department of chemistry has been selected by the British Council for the higher education link programme, involving socially important themes of developing anti-leprosy and anti-filarial drugs. Gulbarga University was the first to implement many higher education programmes in Karnataka. The main campus of the university, Gnanaganga, is situated on 860 acres of land, six kilometres east of Gulbarga city. It has 38 post-graduate departments. Four other post-graduate centres are located at Krishnadevarayanagar, Bellary, Raichur and Bidar. Another post-graduate centre at Basavakalyan is on the anvil. The university enrols about 3,500 students every year for various postgraduate, M Phil and Ph D programmes in various disciplines. There are 305 colleges affiliated to this university which have graduate/diploma courses in arts, fine arts, music, science, technology, commerce, education and law.